In the flooring industry, high quality materials are important, but a skilled and well-trained professional flooring staff is absolutely vital. 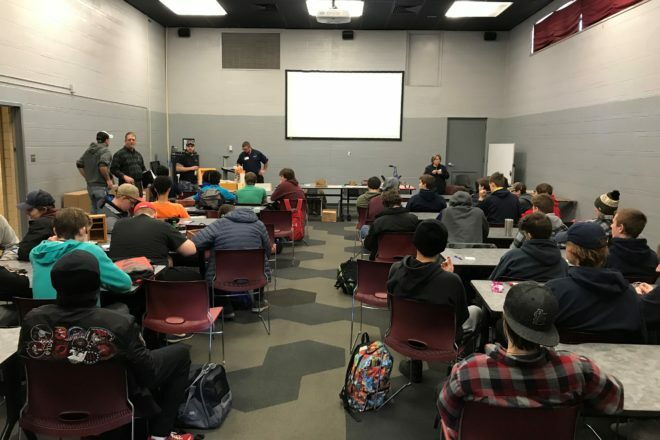 When the Home Builders Association of St. Louis approached Ambassador Floor Company about making a career opportunity presentation to more than 100 students at South Tech High School in Sunset Hills, Mo., the company jumped on the chance to plant the seeds of a flooring installation career with students. Drawn from 23 high schools around the St. Louis area, South Tech is a significant source of valuable technical workers in a variety of fields, including flooring installation. Lee recruited two Ambassador installation professionals – veteran Bryan Benke and newcomer Travis Rochman – to help lead the presentation. The three presenters – all members of the United Brotherhood Of Carpenters, Floor Layers Local 1310 and Install Certified – were carefully chosen to reflect the various stages of, and opportunities in, a flooring career. Apprentice Trainee Rochman has two years of experience in the field, has completed his training in hardwood and vinyl, and is currently training in ceramic. Benke is a journeyman floor layer with 13 years of experience gained after completing a stint in the U.S. Marine Corps as a marine combat, mixed martial arts, and marksmanship instructor. While working as a floor layer, Benke earned his undergraduate degree in business administration as well as an MBA, with the eventual goal of becoming a college professor. Lee started as a flooring company apprentice after high school, moved up to project management, and now is the executive in charge of the day-to-day operations for one of the largest flooring companies in the Midwest. The Ambassador presenters took students through an overview of the various types of flooring, and the particular skills and training needed to specialize in each type, then discussed the benefits and challenges of a career as an installation professional. In particular, the presenters noted that floor laying is a career that can never be replaced by a computer or a machine – well-trained workers always will be needed to skillfully lay both commercial and residential floors. Lee and Benke also talked through the benefits of union membership to both workers and flooring companies, pointing out the ongoing training opportunities offered to members that ensure they are consistently improving skills, staying updated on the latest innovations, and increasing their knowledge base.